All-new redesigned adjustable rear suspension features the new rear upright, unique multi-length adjustable CVD drive shafts, and longer camber link. This new system creates a huge variety of roll center adjustments for different track conditions. Changing roll center has never been quicker or easier. All-new rear uprights feature multiple set-up options for upper & lower roll centers. The upper roll center is adjusted at the camber linkage via shims (up/down & in/out), while the lower roll center is adjustable via eccentric inserts for 9 different positions (up/down & in/out). The multi-function uprights have the upper roll center position in the middle of axis of the connecting joint of the drive shaft to help generate more traction and increase stability. There are three different uprights available: hard (included), graphite (optional), and aluminum (optional), each suitable for particular track conditions. To accommodate the new, fully-adjustable rear upright configuration, the all-new drive shafts are longer. Featuring XRAY’s own unique multi-length drive shaft adjustment there are 4 different length-adjustable positions to alter the length of the drive shaft depending on the roll center position. The all-new safety collar eliminates the clearance of the drive shaft and prevents the drive pin from getting loose. XB2 constant velocity drives (CVDs) are manufactured from world-renowned HUDY Spring Steel™ and feature 2.5mm drive pins for maximum drivetrain efficiency. 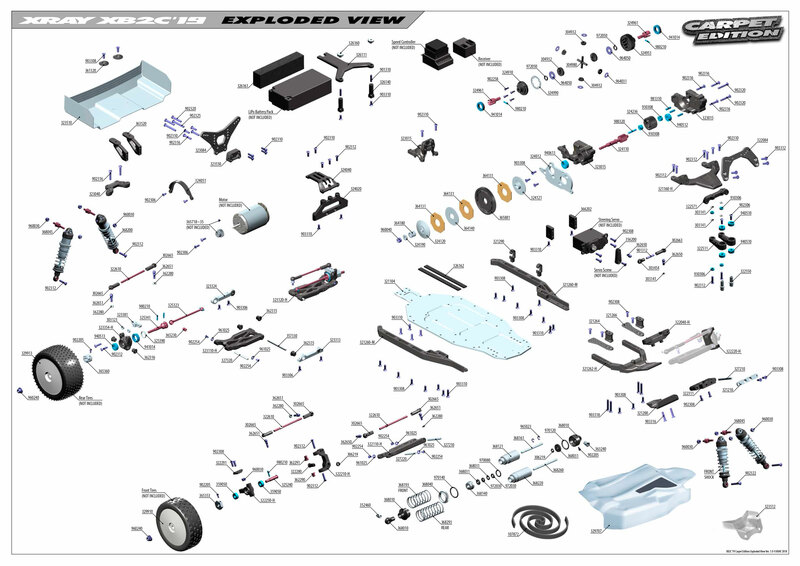 The drive shafts are some of the world‘s thinnest yet most durable drive shafts used in electric off-road cars. Hardened with a proprietary hardening process, the drive shafts provide unbeatable lifespan and reliability. Unique drive shaft length adjustment uses 4 different connecting hole positions at the drive axle end to allow changes to overall driveshaft length. Another great XRAY innovation that accommodates different roll center positions without needing to use drive shafts of differing lengths. With the all-new multiple roll center adjustment possibilities, the rear camber link is longer to accommodate all the different roll center position alternatives. 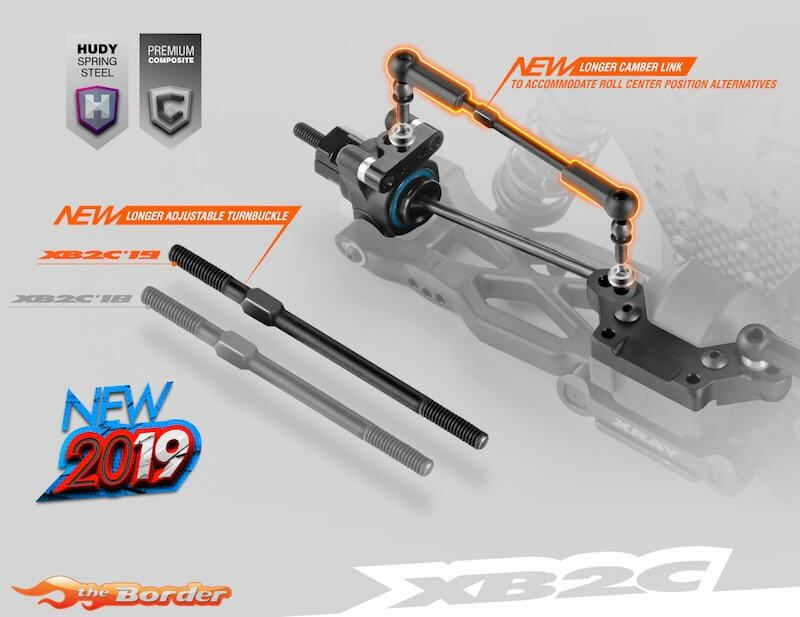 The XB2 now includes the popular hard suspension blocks and 1-slot steering block extensions to improve steering characteristics. The tiny-yet-tough steering blocks are comprised of composite steering blocks and graphite extensions for variable Ackermann positions. 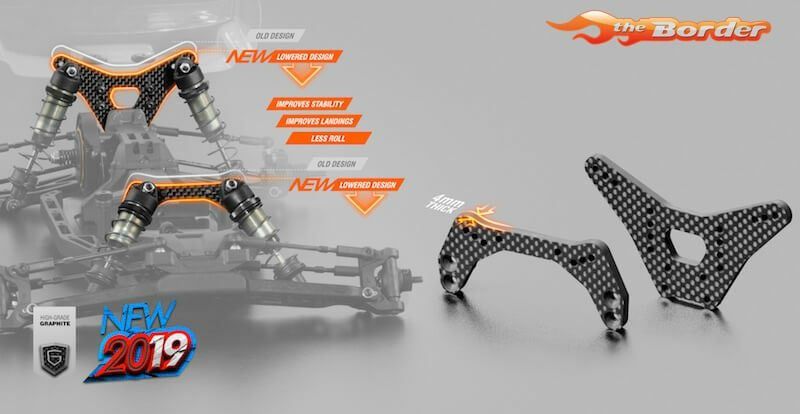 There are three different steering blocks available – medium (optional), hard (included), and graphite (optional), each suitable for particular track conditions. The SLP (Super Low Profile) shock towers reduce front roll to allow running the car without front anti-roll bar and allowing the use of more droop for better landings. The lowered shock towers improve the handling of the XB2, especially in high-traction conditions. CNC-machined shock towers are made from 4.0mm thick premium-grade graphite material for incredible strength and long lifespan. Includes multiple shock positions. All-new SLP (Super Low Profile) shock absorbers offer superior performance, especially for high-traction conditions where together with the SLP shock towers there is a reduced roll of the car, thus allowing the use of more droop for better landings. Both front shock bodies and shock rods were lowered. The shocks are membrane-free while still allowing for easy, consistent building and rebound setting using a bleed-screw shock cap design. Downstop is adjusted using composite shims under the pistons. Upstop travel is adjusted using composite shims under the shock collar. The aluminum body, lower nut, and bleeder shock caps are all machined from premium Swiss 7075 T6 aluminum. Shock rods are machined from special steel material, precision hand-ground for maximum smooth operation, and additionally hardened for improved lifespan. 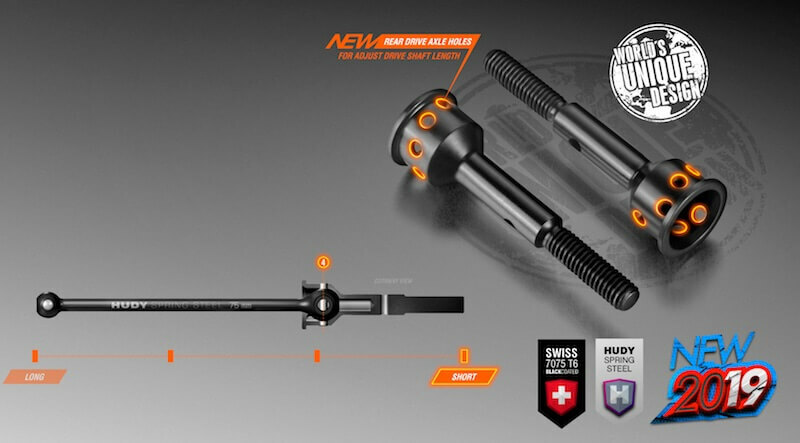 To accommodate the all-new SLP shock absorbers, a new series of SLP shock springs was created. While the new springs were designed specifically for the SLP shocks all of the previously available shock springs will fit the new XB2, providing a large range of tuning options. 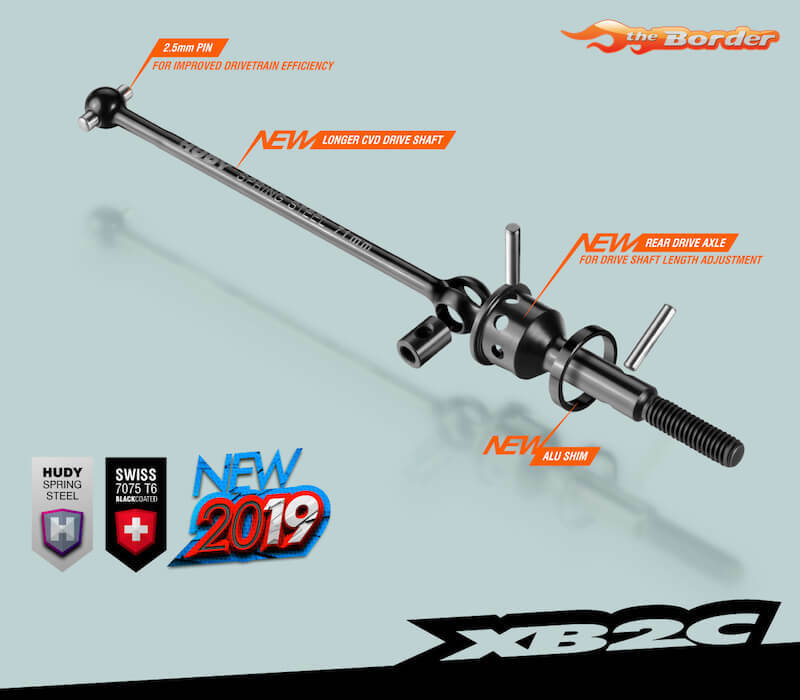 The XB2 springs, like all other XRAY springs, are manually measured, selected, and matched into pairs to guarantee precisely equal length and damping characteristics. Each spring is laser-engraved with stripes to clearly indicate its firmness. All-new molded composite gear cover prevents contact of the spur gear with the body. Moulded from strong, lightweight material, the cover helps to protect the body shell and spur gear. The included XB2 wheels feature a new, redesigned countersunk center area to allow the wheel nut to be sunk deeper. The wheels are perfect for high-competition racing. The wheels are made from a very flexible material, while still being ultra-durable to withstand impacts. The side of the wheel is aerodynamic for maximum performance. The wheels were designed to provide maximum traction. Internal reinforcement ribs make the wheels as stable as possible and eliminate deformation. The wheels feature a 12mm internal hex. 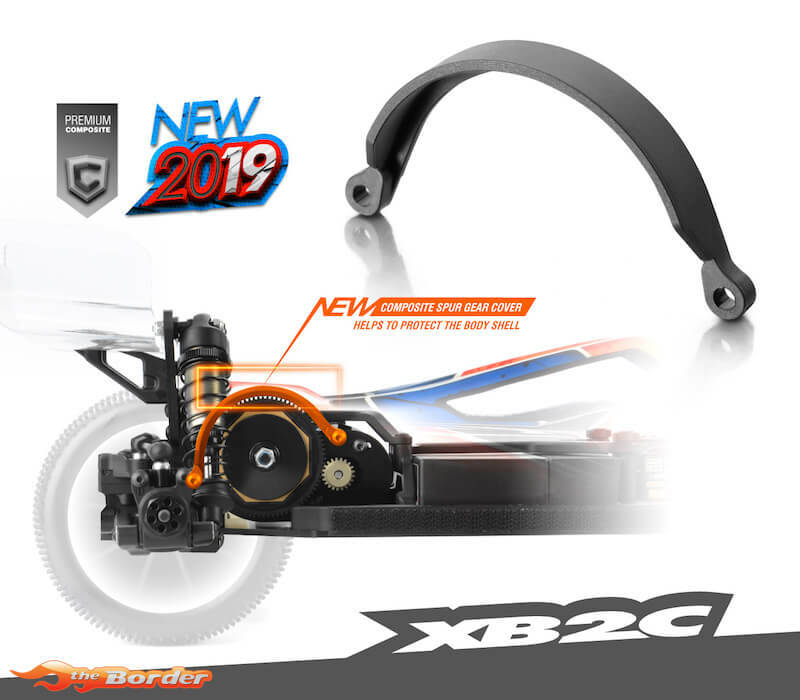 The XB2C includes all-new, completely redesigned, high-performance, low-profile Beta 2 body with super-smooth airflow and all-new downforce areas. The Beta 2 body helps the XB2 by increasing steering & stability while also improving handling in jumps. The front part of the body has a new high-downforce area. The sides of the body have upper downforce areas to generate more mid-body downforce, and the straight sidewalls improve stability. The upper part of the body was redesigned with a smooth flow channel for stability. Different XB2 bodies are available in different thicknesses for fine tuning the performance of the car. 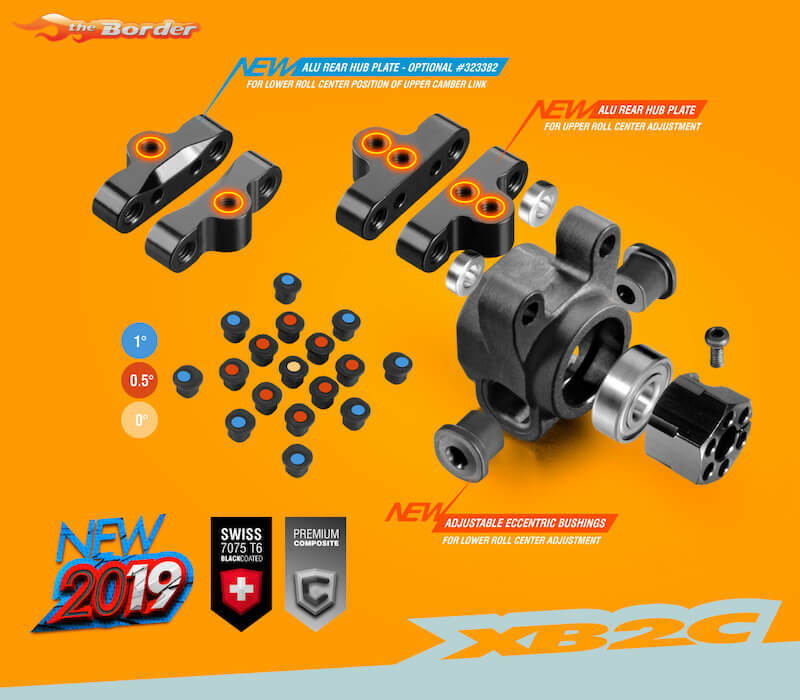 The XB2C features greased ball-bearings for front steering blocks & rear uprights to increase lifespan in dusty conditions. The remaining bearings are degreased and oiled with AeroShell® Fluid 12 for maximum smoothness and long life. A full set of 22 high-speed ball-bearings are used throughout the drivetrain to ensure maximum efficiency. To increase performance in high-traction conditions, the XB2 can use super low ride height. To keep the drive shafts linear the gear box can be raised by 2mm using optional graphite plates. There are two different ride height adjustable plates which allows to raise either only the gear box or also the entire rear suspension.